The city also benefitted from the talents of local high school students and cousins, Pake and Drew Adams. 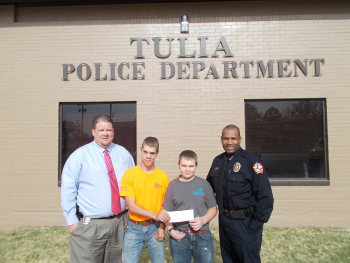 Yarbrough stated that “the letters on our building were constructed by these talented young men.” Drew, a senior and Pake, a freshman developed their skills in Mr. Garry Wilfong’s metal trades class at the Tulia High School, and worked together on the project. They cut each letter out of metal with the help of Justin Byrd at Roll-A-Cone. The students also attached a customized backing to the letters which produces a shadow on the wall. When asked about the Adams', Tulia High School teacher, Garry Wilfong said, “Both boys have excellent work ethics and they strive to excel in everything they do.” Yarbrough said that he was very satisfied with the new improvements and that he has received many positive comments from the public. Visit www.facebook.com/CityofTulia to view more pictures of the improvements.